Lingzi Lu was studying mathematics and statistics at BU. On Sunday, Boston University graduate student Lingzi Lu learned she had passed the first half of the major exam required for her statistics degree, and dashed off an elated e-mail to a professor. “I am so happy to get this result!” she wrote. Faculty brimmed with pride for the bubbly young scholar, said Tasso Kaper, chairman of mathematics and statistics. The next day, Lu headed out into the sunshine with her friends near the Boston Marathon finish line; she never came back. 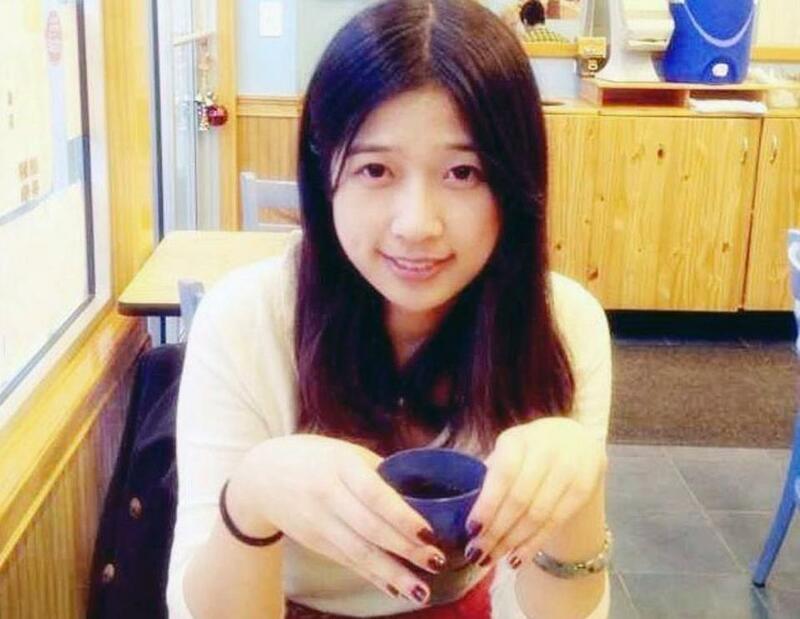 Boston University confirmed Wednesday that Lu, 23, who was from the northeastern Chinese city of Shenyang, was the third victim of the bombings and the last to be identified. The blasts also killed Martin Richard, 8, of Dorchester, and Krystle ­Campbell, 29, of Arlington. Meixu Lu, 24, a graduate student in BU’s College of Fine Arts, said she met Lingzi last fall during a retreat to New Hampshire organized by a campus Christian fellowship group. The two, who were not related, bonded over a love of music and a shared birthplace. Lingzi, who played piano, had planned to attend a recital by Meixu, a cellist, on April 25. Meixu said she first learned of Lu’s death from Chinese media reports. “I’m just really shocked,” she said. A photograph of Boston University graduate student Lingzi Lu sat next to a message board outside the school’s Marsh Chapel on Wednesday. 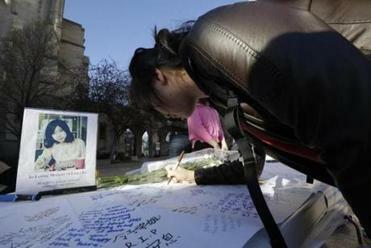 In the chaos after the bombings, friends of Lingzi Lu had frantically posted to Facebook and Twitter that she was missing. They implored police and news outlets to help find her, sharing pictures of a young woman with piercing dark eyes, a sweet smile, and fingernails painted seafoam green. Lu’s roommate reached out to BU’s Chinese Students and Scholars Association, and on Tuesday morning members took to the streets in hopes of finding her. Yijing Lu, 21, who is also unrelated, drove from hospital to hospital until she reached Boston Medical Center, where staff members told her they were treating an unidentified Asian woman who was not stable enough for visitors. Lingzi’s roommate and friends gathered to wait, only to discover, hours later, that the patient was not Lingzi. They were still sitting there when word came that Lingzi had died. “Just silence,” Yijing said, of the moment the news came. Lingzi’s roommate quietly told stories about her, Yijing said, murmuring about the food that Lingzi left in their refrigerator, unable to comprehend that her friend was dead. Kaper said Lu enrolled at BU in fall 2012 after studying economics at the Beijing Institute of Technology. Earlier, she had attended Shenyang’s Northeast Yucai School. She was an exceptional student, Kaper said. She was taking four courses this semester and would have only had one more class to go to complete her statistics degree. She had already begun looking for an internship. The day Lu was killed, Kaper said, she put the finishing touches on a research project for a professional statistics conference. Kaper said Lu was always bright and talkative, and was always in the company of a few of her close friends. Many of Lu’s friends declined to speak, saying they wanted to respect her family’s privacy. One of Lu’s friends with her at the Marathon, Zhou Danling, also a BU graduate student, was seriously injured in the blasts, the college said. She is in stable condition at Boston Medical Center. A third friend was unharmed. During the morning, tributes to Lu had begun appearing at the base of a statue in front of BU’s Marsh Chapel: flowers, a pair of running sneakers, cards that promised never to forget. Freshman Jiani Jiang, 19, of Chengdu, China, visited the makeshift memorial to pay her respects to Lu, who she did not know but whose death made her feel sad and far from home. “There are a lot of foreign students who want to go home now,” she said. Liu, who is originally from Beijing and did not know Lu, said the tokens were meant to show how many people cared for her. “I want her to know, it’s not only people from China that love her; people from Boston love her,” she said. Travis Andersen and Kathleen Burge of the Globe staff and correspondent Katherine Landergan contributed to this report. Evan Allen can be reached at evan.allen@globe.